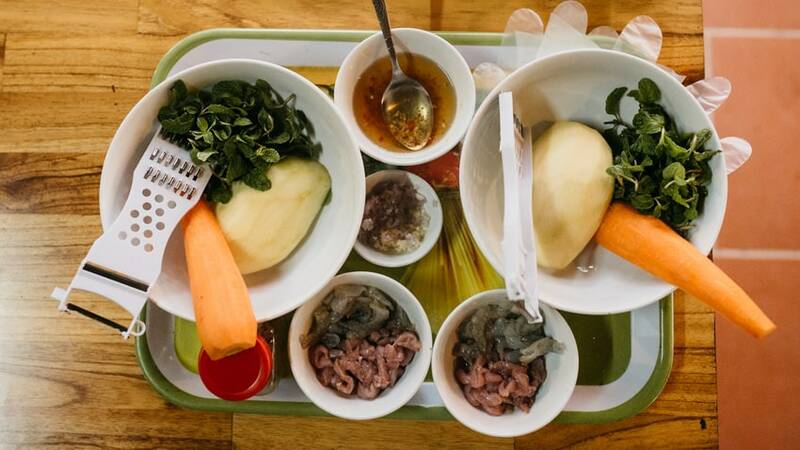 If you come to Vietnam, learn how to cook like a Vietnamese. 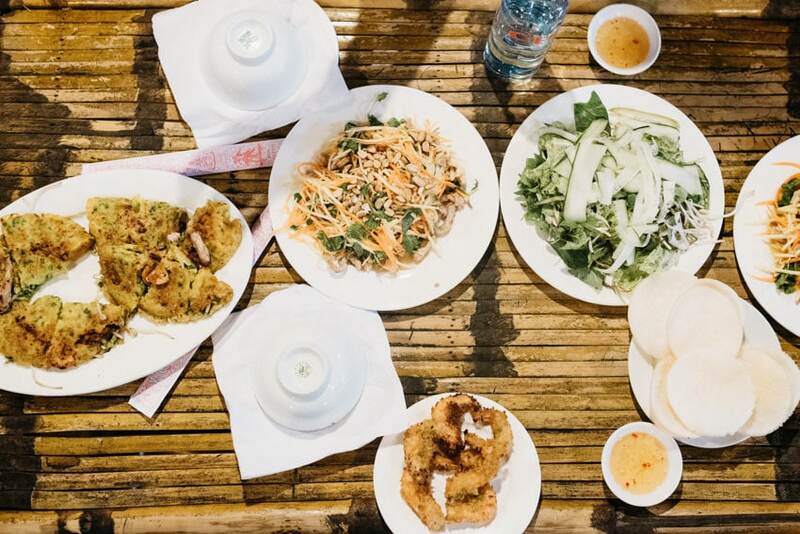 Vietnam is said to have one of the best cuisines in the world – at least, when it comes to street food. We really loved everything we tried in our first days in the country, so we decided to participate in a cooking class in Hoi An. 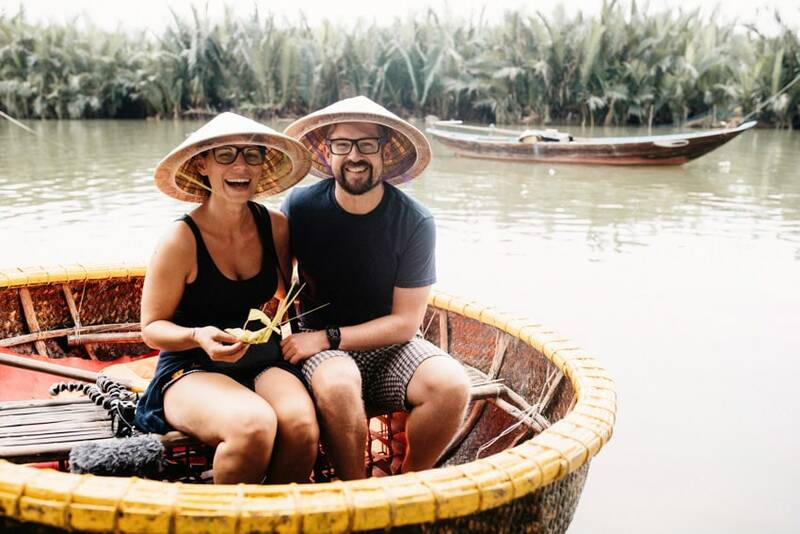 Cooking classes are basically all over the country – however, we decided to do it in Hoi An, as we had time while waiting for our tailor-made clothes to get ready. In Hoi An, almost every restaurant in the old town offers a cooking class for tourists. In the end, friends recommended Long Tran’s “Papa’s Cooking Class” to us. 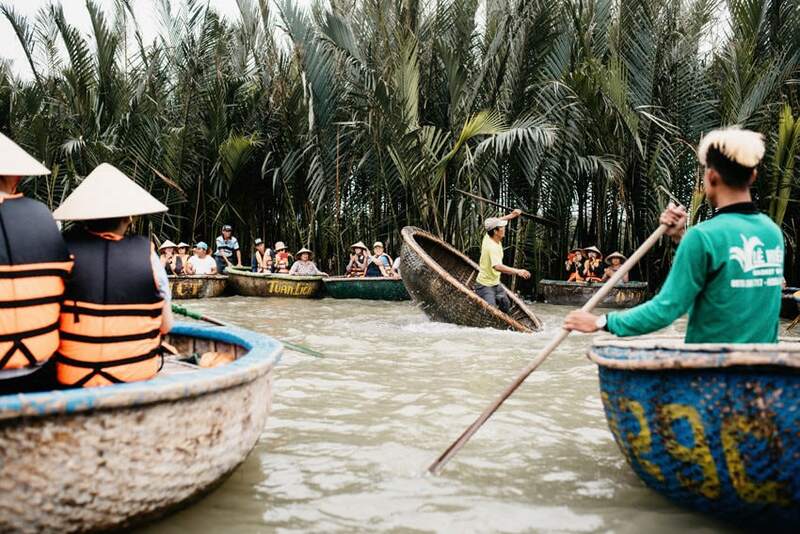 On top of everything we wanted, it even included a fishing / boat tour in Cam Thanh on the Vinh Cua Dai River. 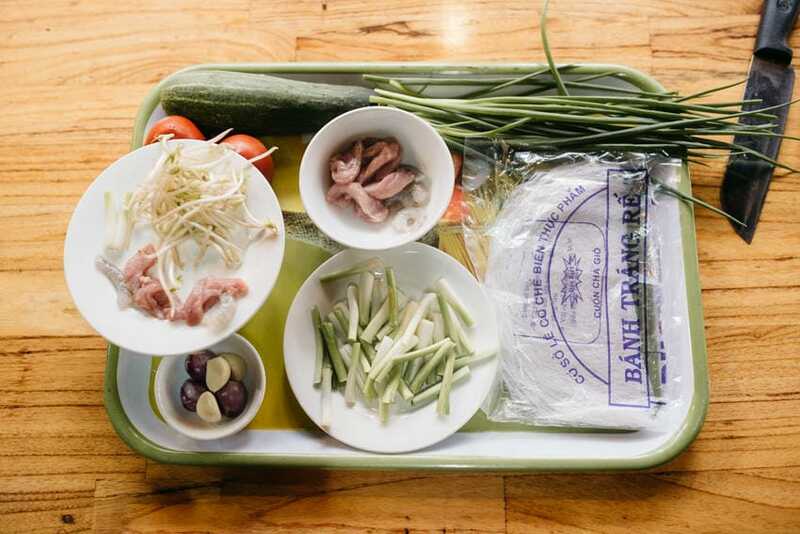 Long Tran offers two cooking classes per day: a morning and an afternoon class. The morning class starts at 9:00 AM, the afternoon class at 2:00 PM. We decided to book the afternoon class as Bianca did not like the idea of cutting onion and garlic or cook fish in the morning. Long picked us up at 2:00 PM at our hotel in Hoi An. Our first stop on the tour was the local market. 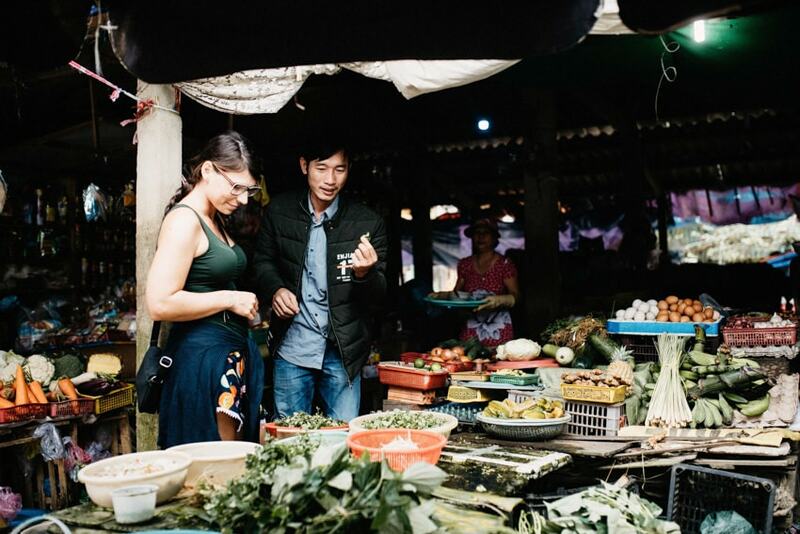 We learnt that Hoi An does not have a supermarket (you can find little markets selling basic stuff in Hoi An but no real supermarket), so the local market is the place to go for grocery shopping. The nearest supermarket is located in Da Nang, which is about 30 kilometres (18 miles) north of Hoi An. As everybody shops at the market, it is totally busy in the morning. When we got there in the afternoon, it was not busy anymore, which was really cool because our guide got to show us all the herbs, fruit, vegetables and Viet specialties that they sell on the market. Long taught us about everything that you can possibly find on the market. We saw different kinds of potatoes – all same but different, which is a common phrase in Vietnam. Many things in Vietnam look totally different (we saw one kind of potato that did not even look anything like a potato – but, in fact, it was a potato. We smelled lots of herbs and our guide was very motivated to ask us again and again if we knew what it is – we, of course, did not recognize or know any them except for cilantro, lemongrass and mint. 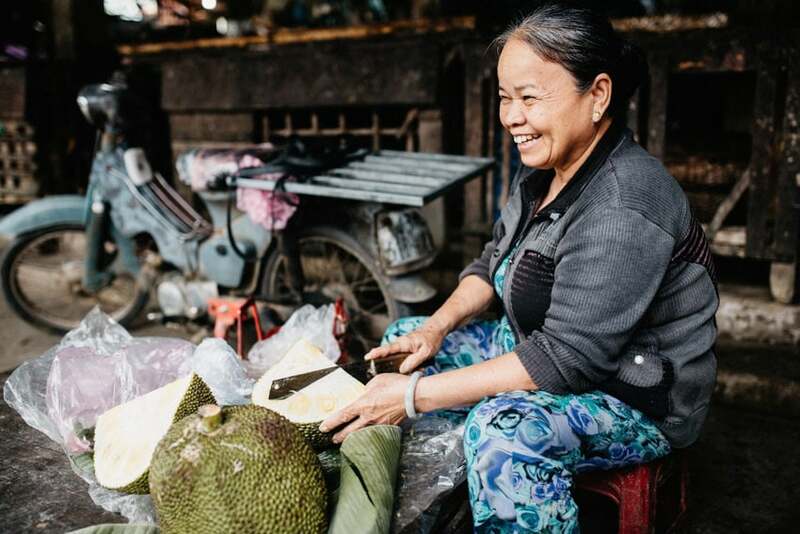 Then we got to see all kinds of fruit – and flashed the guide by knowing all of them (as we really paid attention on our tour to the Mekong Delta). We told him that we had not tried the jackfruit before, so he was very kind and bought a piece for us. The fish wasn’t as delicious and mouth-watering as the fresh fruit, vegetable and herb section. As we have seen it in many of the not-so-developed countries, there is no cooling chain or any special hygienic requirements when dealing with fresh fish or meat. So, the smell was very strong. Bianca has huge problems dealing with the smell – she always struggles very hard in order to not vomit, but now that we have travelled to so many countries, she can hide it so well, that nobody would see in her face that she is actually suffering like hell. Bianca, however, also cannot enter perfumeries either, just because she hates strong smells; Same with men that want that smell like they had just fallen into a perfume pot. To put it in a nutshell, the fish section was not our favourite but still, we wanted an authentic experience so it was good. 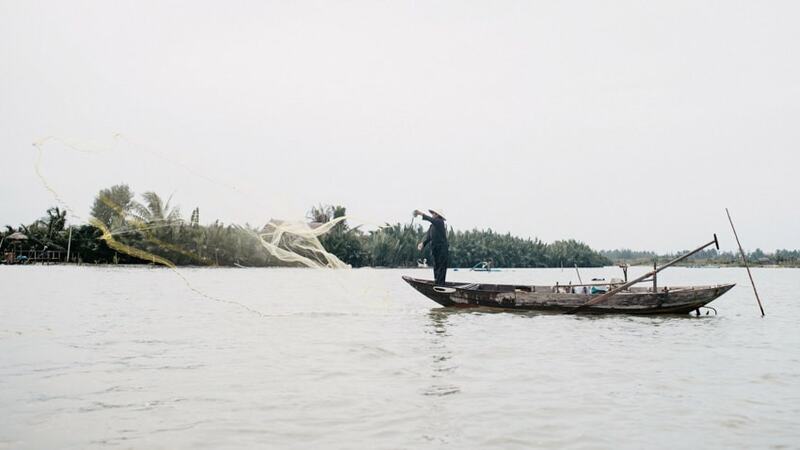 Once we had bought everything we needed and played the fruit-vegetable-herb guessing game extensively and smelled enough fish, we were ready for the next stop: fishing fresh fish from the river. From the market, we drove to the “water coconut village” Cam Thanh. This is also the place where the restaurant of Long’s family is located and were they conduct the cooking class. The restaurant has a nice location at the riverfront – where we boarded the “coconut basket boat” in order to do some fishing and paddle a little bit along the river. 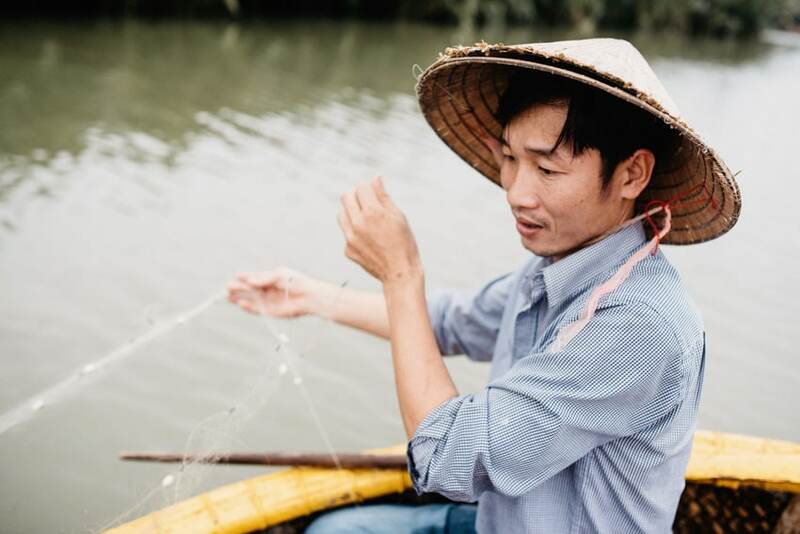 In Cam Thanh they build many things from water coconut (which grows along the river) and bamboo – both are really strong woods and long-lasting. We cast the net into the water and then paddled along the river for about 30 minutes until we came back to check if some fish had gone inside. The 30-minute boat ride was a complete blast. 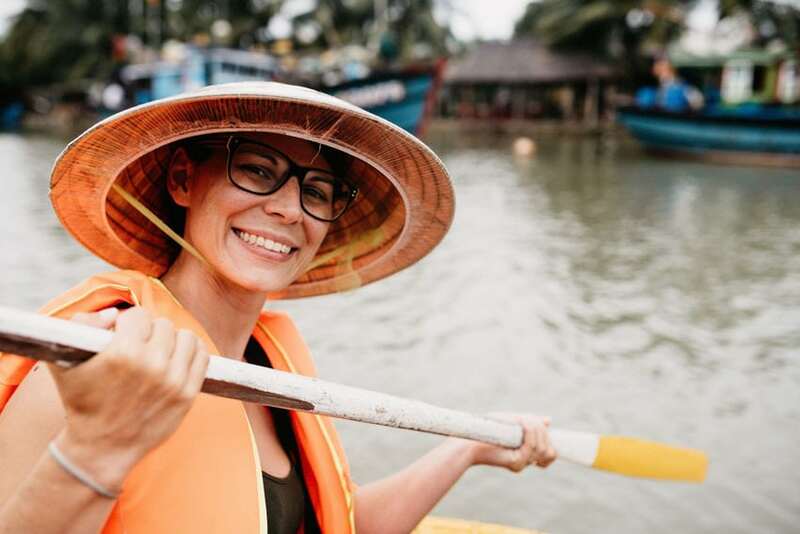 It is very touristy and highly commercial but we enjoyed it a lot because the village has developed its own strategy to attract and entertain tourists from all over the world with their special “coconut basket boat-dance”. Already when we entered the canal, we could hear very loud and pretty modern music (not like traditional Vietnamese music that is primarily extremely awful). When we came around the corner, we saw a man dancing in his little boat – moving and revolving it very fast. Another man was dancing in his boat and swinging his paddle. The Korean tourists looked a little bit intimidated (apart from a few selfie stick artists that took picture like crazy) but we thought it was totally cool. After 30 minutes of fun on the water, we returned to our net – and had caught exactly one fish (that was not really what we perceive as a rich and sufficient dinner) – still, we were proud because “we” had caught one fish (basically, it was the net or better the fish that was stupid enough to get caught in the net but Tom had at least put the net in the water). The next to-do on our tour was the cooking class. Long’s sister does the cooking classes themselves as she is the better cook (at least to Long). We both had our own gas stove, cutting board and knife (a really good knife like the Japanese knives they always sell on the teleshopping channel). Long’s sister showed us how to prepare the dishes and then it was our turn to do it. The most important thing in Vietnamese style cooking is to use tons of oil. Bianca gets problems with her stomach when she eats too fat at night, so she always used kitchen roll to remove the fat (when Long’s sister wasn’t watching) – but when she saw that there was not much fat, she came with a spoon and poured it over Bianca’s cooking meal. So, if you love fat you will love the Vietnamese cuisine, if not, you will still love it. When we had finished the cooking class, they set up the table and we got to eat everything we prepared. They also had cooked clams with chives and peanuts, morning glory (like spinach but cooked and then stir-fried in oil, tuna and rice for us. In the end, the table was full of very delicious things and at the very end of the cooking class experience, we were full with the stuff and could barely breathe or move. The cooking class was really a lot of fun. 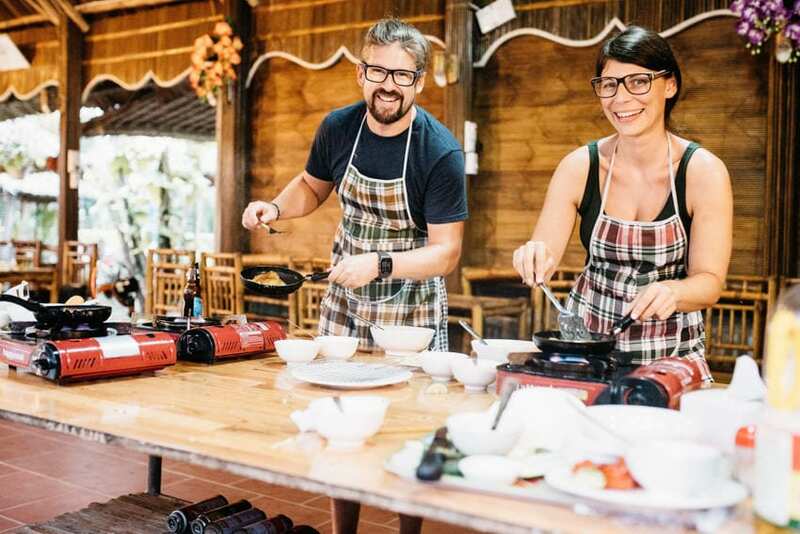 Mr. Long and his family are very nice and try everything that you spend a lovely time in their cooking class. They even gave us a printout with all the recipes, so we can cook everything at home. We really enjoyed it a lot and would definitely book the same tour again. Mix the rice flour with 400 ml water, add the cut chives and mix everything together. The texture should resemble the texture of a pancake dough. Put oil into the hot pan, add shrimp and pork and fry it until it is cooked. Vegetarians can skip the meat and just add mixed vegetables such as carrots, corn and green beans. Pour the dough over the meat and put the bean sprouts on top. 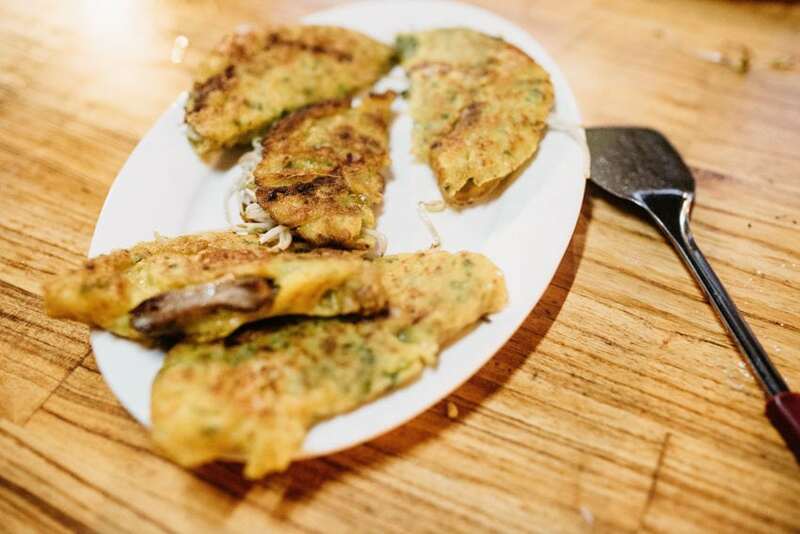 Cover the pan for approximately 2 minutes for the bean sprouts and the dough to cook. Take off the lid, check the bottom of the pancake – if it is brown, turn it around. When it is also brown at the bottom, fold it in the middle – like an omelette. When you think it is done, take it out and serve it with breaded shrimps and Green Papaya Salad. If there is not green papaya available in your country, you can serve it with an ordinary lettuce (just add tomato, cucumber, mint and carrot and prepare it with fresh lemon and Nuoc Cham Sauce to make it almost taste as the original. We loved this cooking class. We had the feeling that it is less touristy and commercial than the others offered by restaurants in Hoi An’s Old Town. The booking process was easy – just send an e-mail and they will answer right away. Long Tran and his family are very gorgeous and did their best to make sure we have a pleasant time with them.